Life is so complicated, isn’t it? Who knew about the controversy swirling around the origins of the Bundt pan/cake, meandering like a chocolate tunnel through a marbled cake? Apparently, there are conflicting claims for the origin of both the cake and pan. The US introduced the so-called “Bundt” (derived from the German “bundkuchen”) in the 1950s. It seems that a group of women from a Minnesotan chapter of Hadassah, the Jewish women’s organization, approached NordicWare to manufacture this pan. I was very surprised by the Jewish connection. I always associated Bundt cakes – made from mixes, of course – with their culinary cosmic twin, the Jello mould. 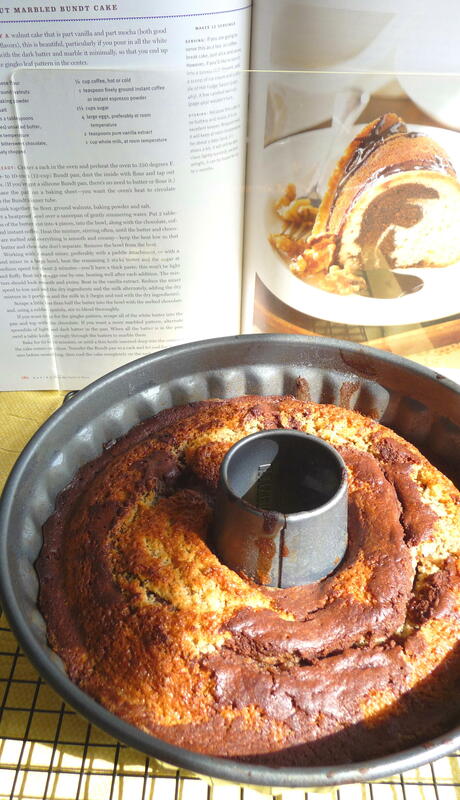 Another association for me was the Bundt cake as quintessentially suburban, having grown up in the suburbs of Chicago. But this cake has a venerable history, long before its alleged invention back in the 1950s. It seems that the American addition of a “t” to the name is a valid claim for originality, as far as its orthography is concerned. 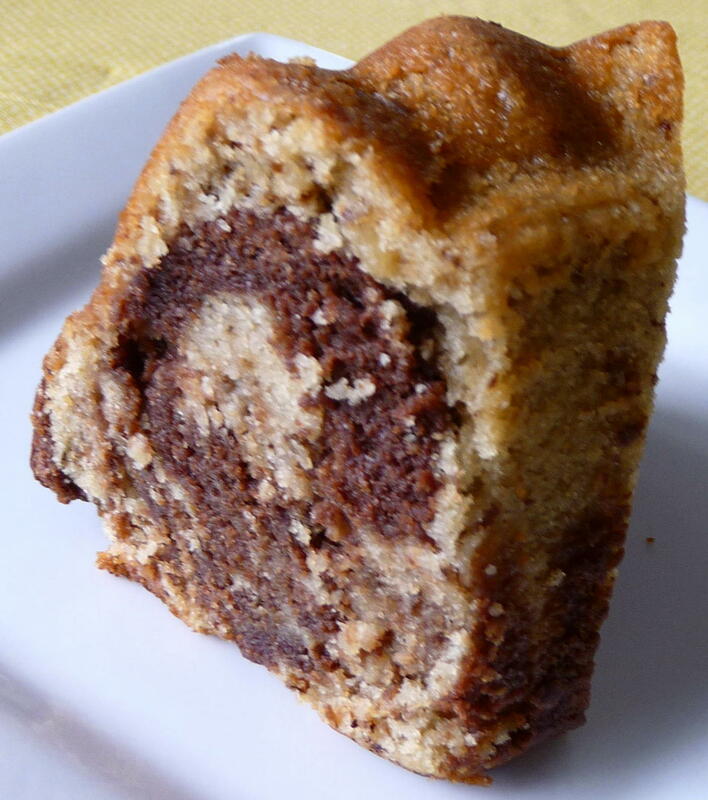 Prior to the “discovery” of the Bundt cake in the US, there was the “gugelhopf” or “kugelhopf” cake, widely admired in Austria, German, Hungary, and other mittel-European countries – and beyond to Switzerland, France, Belgium, and elsewhere. Indeed, I recall a wonderful bakery in St. Kilda’s in Melbourne, Australia, renowned for its exceptional kugelhopf cakes. See “Who Brought the Bundt Cake?” for more on this fascinating saga. One related aspect of the Bundt cake’s mysteries is the popularity of Pillsbury’s “tunnel of fudge” cake; I vaguely remember references to this famed creation in my childhood during the 1970s. However, its name still makes me chuckle – “tunnel of love” from amusement parks, for instance. or other less savory associations, such the sludge-metal-post-punk band, “Fudge Tunnel”, that might spring to mind. In any event, a cake I tried for the first time yesterday was from one of my baking cookbook standards, Dorie Greenspan’s Baking: From My Home to Yours. 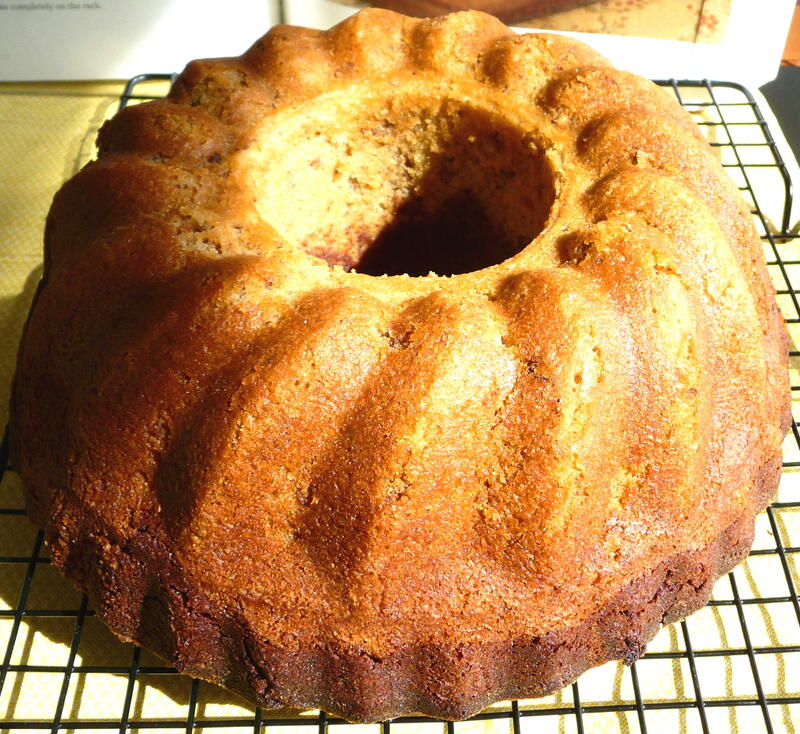 I had offered to make dessert for a dinner party at the home of our friends, D and V. I had made a few coffee cakes previously in a German kugelhopf mould I had bought several years ago, though I had not expanded my repertoire into the realm of Bundt cakes. Perhaps it was the suburban-cake-mix associations that had turned me off to the Bundt, but Dorie has a superb selection in her cookbook. This cake appealed to me, as it really is a kind of superfood, what with all the health benefits in walnuts, chocolate, coffee, eggs (protein, lecithin, and good cholesterol! ), and butter, which provides 20 benefits. Perhaps this is my attempt to justify eating cake, as if we would ever need to do such a thing. A thrifty aspect of this recipe is that it makes very good use of those powdery nutty bits lingering on the bottom of your walnut container. 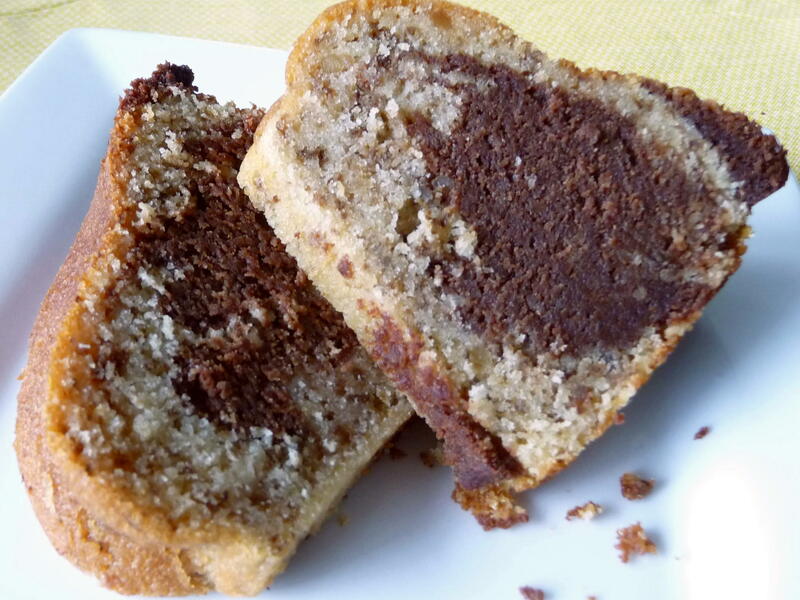 The white part of the cake has a tender crumb which highlights the walnuttiness of the batter, with a very rich moist mocha “tunnel of fudge” running through the middle. I tried Dorie’s “gingko” pattern, by pouring the white batter in first, layering the mocha remainder on top and swirling away with a dinner knife. While I had never heard of the “gingko” effect before, I now know how simple it is to achieve. Maybe the “gingko effect” is comparable to the memory-boosting qualities attributed to gingko biloba — yet another reason to try this cake for its wholesomeness. All in all, this was an easy cake to make, with a stand mixer, and the result is one perfect for a casual dinner, afternoon tea, or even as a brunch cake. The cake complements coffee, of course, and goes very well with green tea and peppermint tea. This marbled mocha-walnut Bundt cake is an appropriate nod to its kugelhopf ancestry as well as to the initiative the Hadassah sisterhood took in getting an updated pan produced for bakers today. Essentially a walnut cake this is part vanilla and part mocha (both good go-with-walnut flavors), this is a beautiful, particularly if you pour in all the white batter, cover it with the dark batter and marble it minimally, so that you end up with a chocolate gingko leaf pattern in the center. GETTING READY: Center a rack in the oven and preheat the oven to 350 degrees F. Butter a 9- to 10-inch (12-cup) Bundt pan, dust the inside with flour and tap out the excess. (If you’ve got a silicone Bundt pan, there’s no need to butter or flour it.) Don’t place the pan on a baking sheet – you want the oven’s heat to circulate through the Bundt’s inner tube. Whisk together the flour, ground walnuts, baking powder, and salt. Working with a stand mixer, preferably with a paddle attachment or with a hand mixer in a large bowl, beat the remaining 2 sticks of butter and the sugar at medium speed for about 3 minutes – you’ll have a thick paste; this won’t be light and fluffy. Beat in the eggs one by one, beating well after each addition. The mixture should look smooth and satiny. Beat in the vanilla extract. Reduce the mixer speed to low and add the dry ingredients and the milk alternately, adding the dry mixture in 3 portions and the milk in 2 (begin and end with the dry ingredients). Scrape a little less than half of the batter into the bowl with the melted chocolate and, using a rubber spatula, stir to blend thoroughly. If you want to go for the gingko pattern, scrape all of the white batter into the pan and top with the chocolate. If you want a more marbled pattern, alternate spoonfuls of light and dark batter in the pan. When all the batter is in the pan, swirl a table knife sparingly through the batters to marble them. 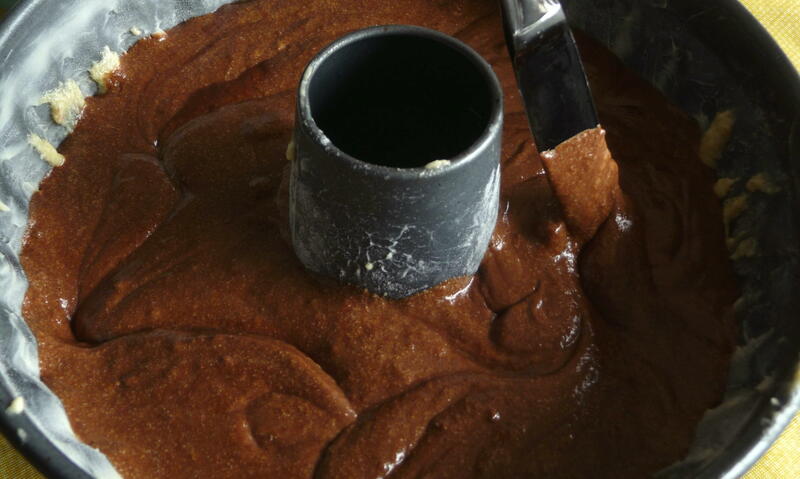 Bake for 65 to 70 minutes, or until a thin knife inserted deep into the center of the cake comes out clean. Transfer the Bundt pan to a rack and let cool for 10 minutes before unmoulding, then cool the cake completely on the rack. This entry was posted in Baking, Cakes, Dessert, Recipes Misc and tagged Bundt, Cake, Dessert, Marble, Mocha, Walnut. Bookmark the permalink. Thank you for your nice words. It was delicious and easy to make! Thanks for taking the time to stop by and make a comment. I learned quite a bit about the Bundt, too! This is funny b/c I don’t have a bundt pan and I’ve been meaning to get one for weeks. WILL REMEMBER NOW! Oh, and that middle photo is excellent! Thanks, Stella. I agree – I thought the idea of the Hadassah ladies marching into NordicWare was both funny and surprising. Who knew? Good luck with your purchase of the pan (they’re always available at TJ Maxx and Marshall’s, I’ve noticed…). I appreciate your compliment on the photo, too. Hey Dan, yes the Hadassah ladies and the ‘NORDIC’ ware thing is a bit comical. BTW, I always check Marshals and Ross first before going to the major retailers. I sometimes find Le Creuset in perfect form there for 2/3 off! Hi Dan, Thanks for stopping by my blog! Your cake turned out lovely. I’m impressed with your marbling abilities. Good job! A gorgeous bundt cake, love the marbling effect! very interesting site!!! m loving this delicious cake!! Oh dear. May I have a slice of wholesomeness, please? I’m ashamed to admit I never knew the history behind the Bundt pan. And while the cakes were always delicious, the name of the pan never appealed to me. Bundt. Reminds me of the sound day-old meatloaf makes when dropped on the floor. The question is, did you eat the day-old meatloaf which made the “bundt” sound when it fell?? I probably would have…. tq for the history of th e bundt pan…very interesting. Thanks for stopping by and making such a nice comment!